Great CASE!! Can't wait to hear more about your new job at the school! LOVE It. I'm honored you cased me! Love this!! It is fabulous!! Ohhhhhhhh I love the sage shadow and choc chip!!! Such a rich colour combo Nancy! Fantastic girl! 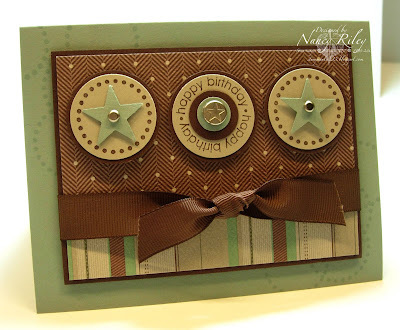 Love this colour combo - those DPs are fabulous and you've used them sooo well - gorgeous! Great colors and layout, Nancy. Love that tweed paper - and your treatment of the stars! Fabulous guy card! I have that paper, and haven't cut into it yet. You make it look so good! Gorgeous card. Love the colours. Congratulations on the new job - can't wait to hear more about it! So awesome! Love it! I have such a hard time creating masculine cards, and this one is just great! This IS a great guy card! TFS!! This is fabulous - I always need inspiration for male cards! So gorgeous!! This is one brilliant masculine card!! I love it!! TFS! Super, super cute (ahem, I mean handsome) card!!! Love it!